WASHINGTON – A federal appeals court Thursday overturned immigration violations against a Valley business, saying that the Immigration and Customs Enforcement investigation of the firm was sparked by an illegal 2013 raid by the Maricopa County Sheriff’s Office. A panel of the 9th U.S. Circuit Court of Appeals found that deputies distorted and falsified facts to get a warrant to raid two restaurants and Bret Frimmel’s home, an “egregious” violation of Frimmel’s Fourth Amendment rights that tainted any evidence the deputies seized. But the court also said that taint extends to evidence that was subsequently developed by ICE, since it identified Frimmel through the sheriff’s office raid, with deputies sending reports on their “reckless” raid to the immigration agency. “The evidence resulting from a later (ICE) investigation that is ‘significantly directed’ by identity evidence learned from earlier unlawful conduct is fruit of the poisonous tree,” and must be suppressed, said Judge Dorothy W. Nelson, in the opinion for the court. Calls seeking comment from the Justice Department were not immediately returned Thursday, and an ICE spokeswoman said in an email that the agency would need more detail on the case before it could comment. A previous version of this story misspelled Bret Frimmel’s first name and Leon Silver’s last name. The story has been corrected, but clients who used previous versions are asked to run the correction that can be found here. The raids came on July 17, 2013, under then-Sheriff Joe Arpaio, on suspicion that workers who were leased by Frimmel Management to two Uncle Sam’s restaurants had committed identify theft to obtain employment. 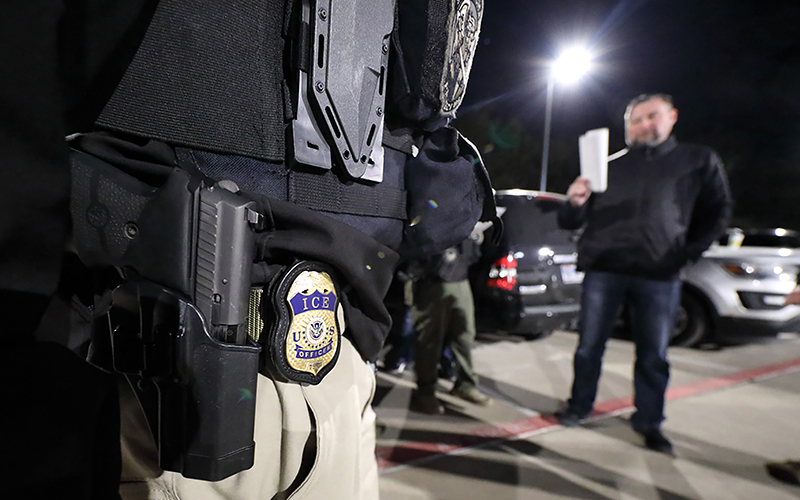 Deputies seized employment records in the raids and ICE subsequently placed immigration holds on nine suspects, court documents said. Arpaio issued a press release about the raids, which garnered local news coverage, and deputies sent a report of their search to ICE agents the next day. ICE officials, who opened their own investigation of Frimmel three weeks later, said they only learned of him through news reports at the time. The unlawful conduct stemmed from affidavits used to get the search warrants for Frimmel. Deputies claimed they were acting on information from confidential informants, for example, when it came from anonymous tipsters, one of whom had been arrested and one whose husband was arrested for stealing from Frimmel. Deputies also made claims about documents that neither tipster made, and withheld the fact the an IRS investigation of Frimmel found no wrongdoing. The sheriff’s office charged Frimmel with identity theft, but those charges were thrown out by a Maricopa County Superior Court judge after reviewing the affidavits. “As the state court correctly found, all the foregoing omissions and inaccuracies were either intentional or reckless given how significant they were,” Nelson wrote. But administrative law judges in the ICE case refused to suppress the evidence, and Frimmel was issued a civil fine of around a half-million dollars for paperwork violations, Silver said. The appeals court Thursday reversed that finding and sent the case back to ICE for a new hearing that the government would have to pursue without the tainted evidence, if it chose to pursue charges again.